Here we are, 2 years down the taxi way from one of aviation’s biggest mysteries. Two years ago 239 passengers and crew settled in for a routine flight from Kuala Lumpur to Beijing. The Boeing 777 belonging to Malaysia’s national flag carrier, Malaysia Airlines, lifted off into the balmy Malaysian night and flew into history. 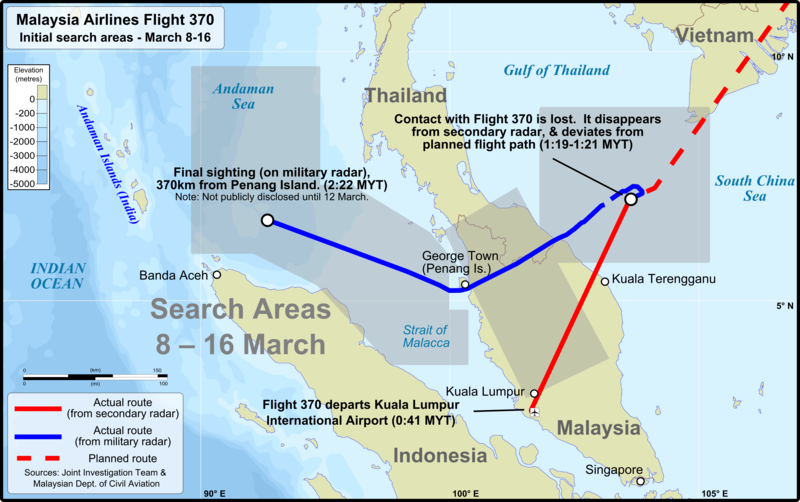 Now on the second anniversary of the aircraft’s disappearance, we seem no closer to finding an answer. Like MH370, a Malaysia Airlines Boeing 777 lifts off. Now on the second anniversary of the aircraft’s disappearance, we seem no closer to finding an answer. it sends inconceivable in today’s high tech world that we can lose a big airliner so utterly and completely. It goes to show that we haven’t quite got the ability to track the movement of everything that goes on in our world. Since that fateful night two years ago, there have been so many theories of cover-ups, lies, and deception. Was it done by a rogue pilot? Was the aircraft deliberately flown below the radar to enable it to be hijacked elsewhere? Was the aircraft flown in the shadow of a Singapore Airlines flight to enable it to be flown to Central Asia undetected. The initial search area for MH370 centred on the logical areas around the Malaysian Peninsula. We’ve heard of an oil rig worker seeing a ball of fire crash into the sea in the distance in the South China Sea. 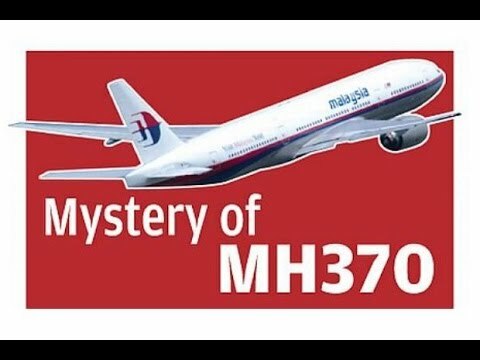 We’ve heard of inhabitants of an island in the Maldives, where large airliners are rarely seen, reporting a low-flying large jet flying overhead hours after the disappearance of the Malaysian Airlines Boeing 777. This prompted a theory about the jet being flown to a small atoll called Diego Garcia which lies just south of the equator in the middle of the Indian Ocean and belongs to Great Britain. It just goes to show that we do not take readily, as humans, to unexplained situations and work to fill the void with theories of what we think the likely train of events may have been. It also serves to show we are quite willing to believe some fairly far-fetched theories to fill the void of actual knowledge. But as usual, it seems fact is stranger than fiction. Of all the far-fetched scenarios, who came up with one where the airliner found its way into the southern reaches of the Indian Ocean? No one as far as I can recall. I must admit that when I first heard of it, I was amazed why someone would believe such a far-fetched story. Of all the stories I had heard, this seemed to be the most fanciful. A flight that was headed north ends up being further south than it was ever intended to go north. 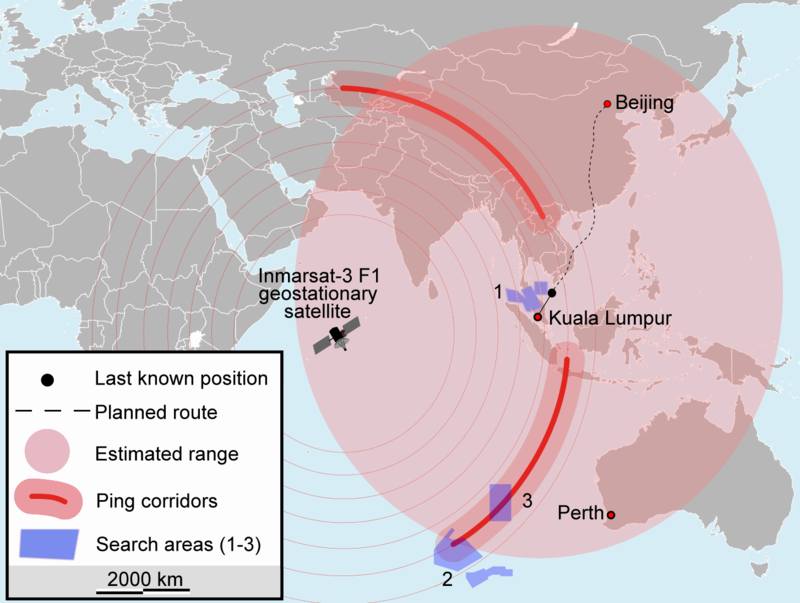 The current search areas determined by satellite pings as well as fuel range limits of MH370. Those engine ping handshakes that gave the arc of area where the aircraft is supposed to have been, were obviously conclusive enough for several governments to throw in millions of dollars’ worth of search time and resource. While it is admirable that governments are seen to be caring about those poor souls who perished, and those who are left behind wondering what became of their loved ones. I am often left wondering why the Southern Indian Ocean scenario was so readily accepted so quickly and that governments were so quick to be prepared to throw millions at the project. I am not trying to promote any of the conspiracy theories. I do find it strange that not one floating object such as seat squabs, neck pillows and other floating objects have never been found. These objects are more susceptible to wind-driven effects, as opposed to the flaperon found on Reunion and the alleged horizontal stabiliser piece found in Mozambique that would have floated below the surface and been more influenced by ocean currents. There are of course many kilometres of uninhabited coast lines around the Indian Ocean, but something should turn up somewhere and be found. If the flaperon and other piece were ripped off the aircraft, I feel it safe to assume the fuselage did not stay intact to contain all the loose objects that should have floated away. I just hope that something is found soon. The friends and relatives need closure and aviation needs to know what happened and how it happened so steps can be taken to remove the likelihood for the future. Aviation because safer as we learn from accidents and incidents and build process to prevent it happening again. I don’t pretend to be an expert in any way shape or form and would love to hear the opinion of others. Feel free to join the discussion below.